I heard all these mean, nasty, hateful things about NBA Live 14. I heard the game stinks on the Xbox One and Playstation 4. I heard it was a horrible basketball game, and more. I know there are haters out there. I know there is an anti-EA sentiment among many gamers. Family Friendly Gaming judges each video game based on the content. When they put in offensive content like was done in Fifa we call them on it. When they make great football games that continue to improve like Madden NFL we will broadcast that as well. I do not understand what all the hubbub is about concerning NBA Live 14. The players are huge looking, and this is a realistic basketball game in most aspects. I did find many of the players to be sluggish and slow. Which makes running around a defender to the hoop very difficult. But passing it around and finding a good shot was pretty easy. The announcers are not that great. EA Sports should have hired our editor in chief to call this game. It would have sounded a lot better. The music on the menu screens is abysmal. Women are dancing around in their underwear during breaks. I plan on a full and comprehensive review in an upcoming issue of Family Friendly Gaming. NBA Live 14 has some issues here and there. Ultimately this home console next generation basketball title is pretty solid. It is way better than I was led to believe. And thus far I feel like I am getting my twenty-two dollars worth. I bought NBA Live 14 used on the Xbox One. 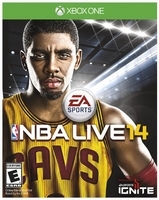 NBA Live 14 is certainly not worth sixty dollars.